This post is part of our series on people, places and things finding new life in 2008. Uno the Beagle made history last month when he took Best of Show in the Westminster Kennel Club Dog Show, becoming the first of his breed to ever do so. Did the winner's triumphant barking herald a comeback of this decidedly un-exotic breed, the Wonder-Bread of canines? Well, not exactly. The American Kennel Club, which has kept registration statistics of AKC-recognized breeds for nearly a century, reports that the humble Beagle, while perhaps not the most fashionable of its species, has never really gone out of style. 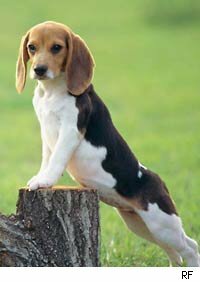 Although the Beagle's popularity peaked during the fifties (think Snoopy), when it ranked most popular from 1954 to 1959, it is the only breed that has consistently remained in the top ten most popular since 1915. Not exactly a B-list-er. Nonetheless, the Westminster victory means the hound can proudly hold his tail upright among any of the other breeds we have come to think of as more fashionable. Some other classic breeds that may be ripe for renewed appreciation include the poodle, which ranked most popular through the sixties and seventies, and the cocker spaniel, which was overtaken by the Beagle as most popular, after ranking number one from 1936-1953, and made a comeback in the eighties.